Village with 2,140 inhabitants on the eastern part of Hajdú-Bihar county, 21 kms from Debrecen. Its history was common with Hosszúpályi until 1415, it was first mentioned then by the name of Monostorpauly. The 'Rákóczi ditch' on the northern part of the village has preserved the memory of Rákóczi's war of independence. Outstanding natural sight is the 6 hectare protected black pine forest. The Gorove mansion surrounded by park was built at the turn of the 18th and 19th centuries. 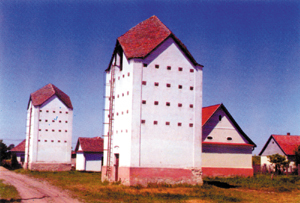 The one-time farm buildings , the two so called 'Tubus' granaries were built in 1826 in neo-Classical, late Baroque style. Other sights are the Calvinist church from the 18th century, the Roman Catholic house of prayer and parsonage, the former Paksy mansion and the one-time primary school.